The BordO2 Dopamine E-Liquid is a blast for your senses, an e-juice that will wake you up and leave you feeling refreshed. A blend of blueberries, aniseed and menthol, this is not for the faint hearted but is bursting with flavour for those brave enough to handle it. BordO2 is a French based company who use experts in food and wine to ensure the best flavour for their e-juices while focusing on class and quality. 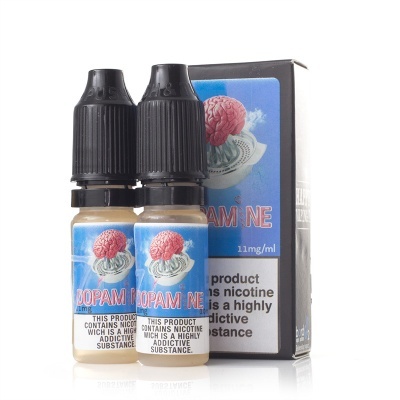 Dopamine E-Juice is available in a pack of two 10ml bottles with three different nicotine strengths for your personal preference. All bottles are supplied with a child-proof applicator. Dopamine is an explosion of flavours, with deep undertones for a rich taste. A blend of blueberries and aniseed provides the depth of flavour while the added menthol finish gives this e-juice is a cool and refreshing finish that will wake up your taste buds with a jolt. This e-liquid is ideal for any time of the day as it is neither too sweet nor too strong. Dopamine has a blend of 50/50 (VG/PG) for a balanced vaping experience. If you prefer a higher VG level, try out the Dopamine VG for the same intense flavour but a blend of 80/20 VG/PG. BordO2 Dopamine E-Liquid is supplied in a pack of two 10ml bottles only.